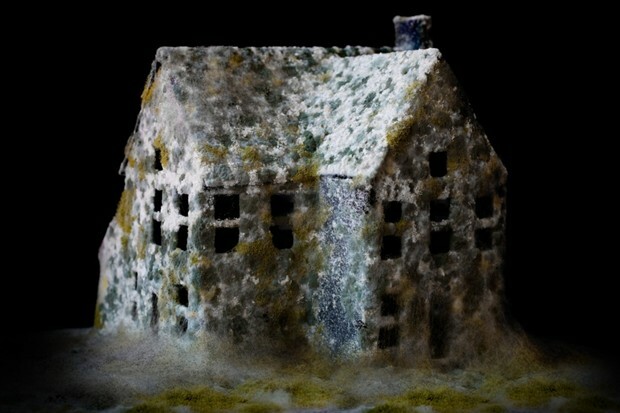 Whilst exploring decay as an art from across the internet, I came across an article (link below) entitled “ARTIST USES MOULD TO CREATE DECAYED ARCHITECTURAL MODELS” and was obviously instantly interested. 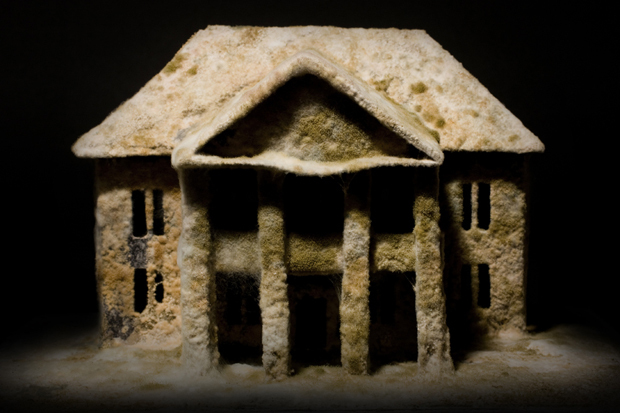 Artist Daniele Del Nero creates architectural scale models of buildings and then dampens the exterior of the structure and applies a thin dusting of flour. The model is then placed into a transparent case, which relates to my moulding perspex boxes. 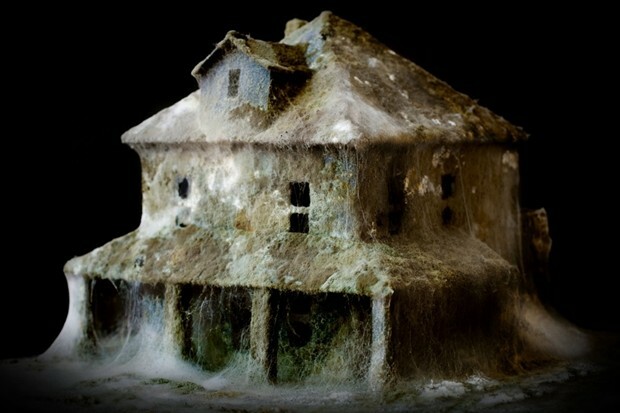 Mould starts to grow after a couple of days and dies within two weeks, leaving behind what the artist has described as “a dusty spider-web which covers the model like a rambler plant“. 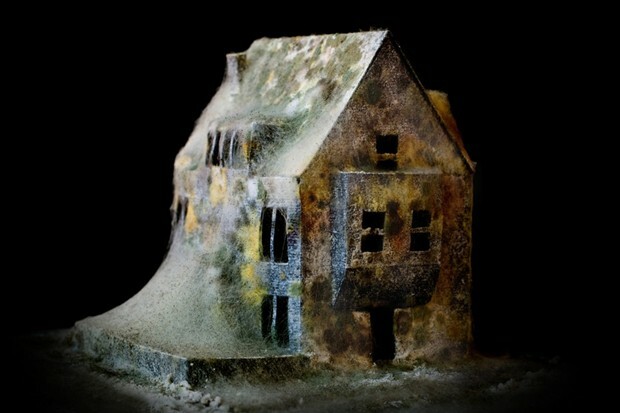 These works are AMAZING, they are definitely my favourite works out of all the other artists I’ve come across that use mould to create art. The photographs are beautiful as well as the pieces themselves. His work encourages me experiment with getting a more professional photo of my perspex boxes and other moulding objects as I don’t feel these would look as successful without the high level of photography and dark background. There is something very eery about these pieces, but I absolutely love them. Daniele Del Nero’s work is without a doubt a success. 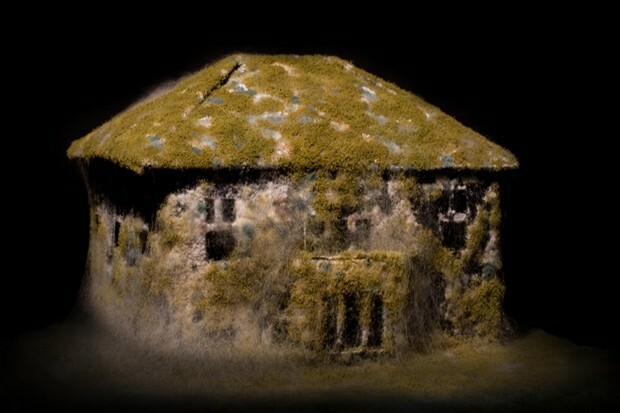 He wanted to “reproduce in small-scale the particular sensation of being in a lonely, abandoned place” and I feel he has without a doubt achieved this. He is a massive inspiration to me right now and his work definitely makes me want to experiment with creating 3D works and to use mould to create a certain feeling or atmosphere.